Dry existing moisture off the pork really well with paper towel. Mix the paprika, garlic power, dry mustard, salt and brown sugar together in a small bowl. Rub the spice blend all over the pork. Place the pork in a roasting pan and cover with foil. Roast for 4 hours, remove foil and continue to roast uncovered for 2 additional hours. Allow pork to rest 10-15 minutes. Transfer warm pork to platter and pull meat into long shreds using 2 forks. Get rid of the fat and anything else that doesn't look edible. Toss the pork with pan juices and add salt to taste. Pour 1/2 of the bbq sauce on the shredded pork and mix well to coat. 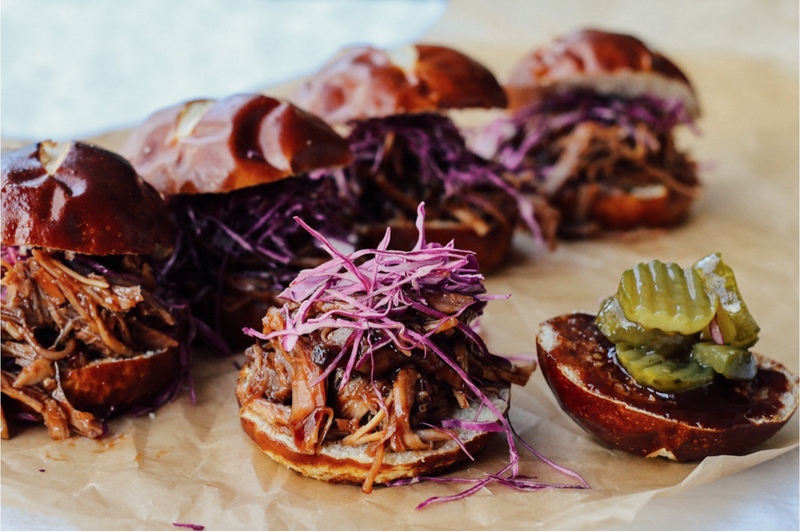 To assemble sliders, place pulled pork mixture onto the bottom 1/2 of a pretzel bun, and top with cabbage and pickles. Serve remaining sauce on the side. Whisk all ingredients in a medium saucepan. Bring to a simmer and cook over low heat until thickened. Stir occasionally, about 15-20 minutes. Allow sauce to cool to room temperature. Transfer to an airtight container or jar. Will store in the refrigerator up to 5 days.